NEWARK, NEW JERSEY – Greg Vanney vs. Jesse Marsch. The Eastern Conference semifinal series between Toronto FC and the New York Red Bulls isn’t just a contrast of two teams who play distinct brands of soccer. It’s also a fascinating battle between two of Major League Soccer’s bright, young coaches. Both Vanney (a defender) and Marsch (a midfielder) enjoyed distinguished playing careers in MLS before going on to achieving success in the league on the touchline. 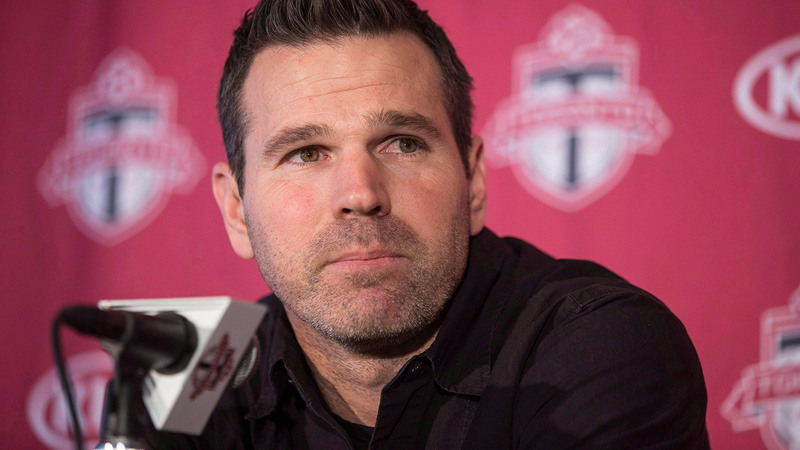 Sportsnet chatted one-on-one with Vanney ahead of Monday’s opening leg of the Eastern Conference semifinal about how his career has mirrored Marsch’s, how the Red Bulls’ style of play is a reflection of their coach, and why it’s a good thing that teams are hiring so many former MLS players as managers. What’s your relationship like with Jesse Marsch? How would you characterize it? It’s professional. We never really played together. We’ve always played against each other. The most time we spent together was doing a [coaching] course for U.S. Soccer, and even then, we had fair amount of work that we were doing at the time, so we really didn’t socialize. How would I describe our relationship? Friendly. Cordial. Professional. It’s not like we’re calling each other on the phone. We’ve crossed paths a lot, but we’ve never really had the opportunity to spend some time together. You went up against Marsch during your playing career. What was he like as an opponent? He was a feisty competitor. He’s the same way as a coach, the same way he has his team playing. He was a smart player who understood his strengths and weaknesses; he was a guy who was always present in the midfield for a tackle or a challenge to clean up a mess, to keep the ball moving. But he was a guy who, no matter what, was there to compete and disrupt the opposition. He was smart about the ways he went about doing what he did. He understood who he was as a player, and that’s what made him successful. Watching him on the sidelines as a coach, he’s a whirling dervish – constantly moving, very animated and he is the fourth official’s ear quite a bit. You’re almost the exact opposite: very calm and sedate. It’s an interesting sight to see you guys side-by-side on the touchline. I wonder how much these two teams are reflections of their coaches? He was a defensive midfielder whose primary job, aside from keeping the game simple and moving, was to mix it up with the opposition. The way his team plays, with such a high energy, high tempo, high press, that’s the way he drives them and motivates them, and pushes them. He’s looking for every edge possible to win the game. That’s his approach, both as a player and a coach. For me, I want my team to be cerebral and calm, to think through things, and to recognize what’s going on. At times, I get fired up, but I process the game in a slightly different way than he does. It’s whatever works – there’s no right or wrong way. It reflects what you want out of your team, because your team is also feeding off of you. The way New York plays, they want a little bit of a hectic and frantic transition game, so he’s always winding them up in that way. As you said, they play that high press and try to force their opponents to make turnovers. TFC likes to build out from the back, so it’s a real contrast in styles. Do you enjoy trading tactical wits with Marsch? I do, yeah. New York is very clear on what their philosophy is, and they don’t stray too far away from that. They’ve been successful in understanding who they are and what they want. When you put a team together, you put it together in the image of how you want your group to play, so in that way it’s fun to play them. They have a high-tempo game that forces you to play smart. They’re tough to beat. In the last game [a 4-2 home win for TFC on Sept. 30], we managed to go up 2-0 but Jesse shifted their shape a little bit, which created new reference points for us, but he’s not typically one to have a lot of nuances – their style of play is their style of play. He might make slight adjustments, but he won’t vary it a tonne. You and Jesse have had very similar career paths. You were both drafted in 1996. You made your pro debuts that same year. You both enjoyed successful MLS careers, and you both became successful coaches in this league. He won MLS Cup twice as a player, and I never won it, but I don’t hold that against him. [laughs] I have a lot of respect for him. Jesse is a cerebral guy. He’s very smart. He is very true to his vision, and he’s very clear about what his vision is and how he wants to go about getting it out on the field. That’s one of the most important things for a coach: be clear in what you want, and know how you want to get it across to your players. He does a phenomenal job of that, and that’s why his team has been so successful over the last few years. The same for us. My vision isn’t the same as Jesse’s, but I have a clear vision of what I we want, and a clear idea of transferring that vision to the players. We’ve both been able to have some success because we have very clear paths to what we want to see our teams do, and it matches both our personalities, our view of the game and we’ve been able to transfer that to our teams. You and Jesse are two young coaches who are succeeding in MLS after having distinguished playing careers in the league. There are other teams who hired young coaches who were former MLS players: Carl Robinson in Vancouver, Ben Olsen in D.C, Jason Kreis in Orlando, Jim Curtin in Philadelphia, Mike Petke in Salt Lake City, to name a few. How gratifying is it to see so many teams hire “within MLS” instead of bringing in an international coach? I think it’s important. The league is not just for developing players – it’s also for developing coaches. Our league is unique. Until Tata Martino [at Atlanta United] this year and [New York City FC coach] Patrick Vieira over the last couple of years, there haven’t been many international managers who’ve been successful in MLS. There are nuances to working with the American and Canadian players, and there are nuances to understanding our league and what makes teams successful. Those of us who have come through the league, and know how to teach and manage and coach are the group of guys who are hopefully destined for success in this league. It’s also the future of soccer in North America, though. You just can’t develop players and not coaches. It’s a two-way street. It’s nice to see guys like myself, and Jesse, Carl [Robinson] and other young coaches get a chance. We’ve all improved over the years we’ve been at this, and we’ll continue to improve. It’s exciting for the league. Toronto FC supporters get an inside look into their favourite club every Monday night at 11 p.m. ET on Sportsnet 590 The FAN. It’s an all-access pass with co-hosts Brendan Dunlop and Thomas Michalakos as they interview the biggest names around the team and preview and review of every TFC match.